First thing you need to do is determine what kind of CPU your Synology NAS has. The easiest way is looking it up in on the Synology Wiki page (What kind of CPU does my NAS have). In case of my DS212+ it’s a Marvell Kirkwood mv6282. Now you know what CPU your Synology NAS has you can find the appropriate bootstrap. More information about install ipkg can be found here. As an alternative you can use Package Center to install ipkg. More information can be found at quadrat4.de. just to ask in step 7 can u explain how to add the comment lines?? You can comment the lines with the pound (#) sign. There’s an example in screenshot 5. 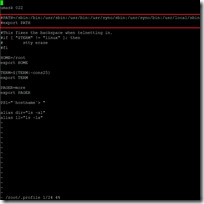 Then use the down cursor key to move the cursor to the start of the line “PATH=/sbin…” and put a “#” infront of this line so it is now “#PATH=/sbin…”. Do the same for the line below so it is now “#export PATH”. Now press the escape key (to exit edit mode) and type “ZZ” (note they are capitals) to tell vi to save the file and exit. 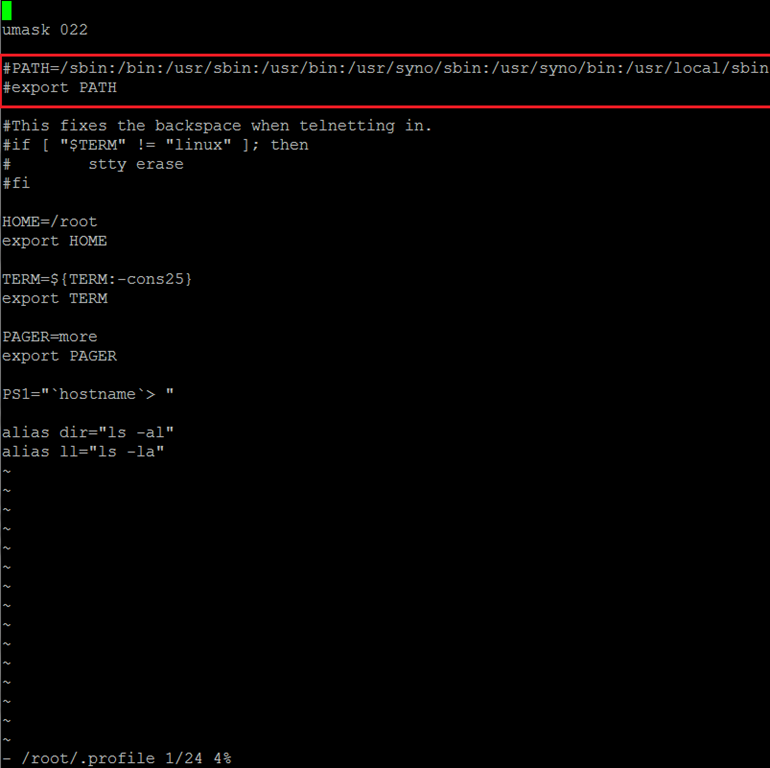 Why is it necessary to comment out the two lines in /root/.profile for DSM 4.0 and not for DSM 4.1 and above? I haven’t tested this yet, but I think it applies to DSM 4.x instead of 4.0. Have you tried it yet? Just installed the bootstrap on DSM 4.2, commented out the lines in .profile and rebooted. Everything working fine. Thank you for the link, i’ve updated it in the table. My CPU on my DS412+ is an Intel Atom D2700 Dualcore (2C/4T) 2.13GHz x86 Processor (64-bit from what I’ve read). I noticed that the bootstrap listed in your table above is for i686. Is that still the appropriate bootstrap for my CPU? The processor in your DS412+ indeed is indeed a 64-bit processor (see http://ark.intel.com/products/59683/intel-atom-processor-d2700-1m-cache-2_13-ghz). Nonetheless the bootstrap is correct. On another note, do you have any ideas on how to give a user (the big boss)RDP access from his home machine to his office PC through the Diskstation? I know I can setup a VPN to give LAN access but we don’t have a windows server for Terminal Services, and he doesn’t want to pay for LogMeIn. Any hints for a bootstrap file for my 213+ with a	Freescale QorIQ P1022 CPU? After installing ipkg from cli it works well. When I do a system update it is broken. How can I do a system update without braking bootstrap? Thank you for this; this worked great! My CPU is this one Marvell Armada 370 88F6707 Which package is the right one? Thanks alot!